Eight years ago, we were tossing around the idea of adopting a dog, but had yet to find the right one. 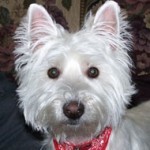 When we saw Dee Dee’s picture on the Westie Rescue website, we instantly knew that she was our dog. We adopted her in October 2005 as a 9-year-old, and right away she transformed a couple into a family. She never stopped proving that age was only a number, and we were pleasantly surprised to discover that she had boundless energy. One of her favorite things to do was chase after her squeaky footballs, and more often than not, we would tire out before she would! She had an incredibly sweet disposition, and because of this, found her way into the hearts of our family, friends and neighbors. There were many times during our walks that one of the neighborhood kids would see her, scream her name, and come running over to pet her. Our 4-year-old niece, Alex, had a particular fondness for her from the time she was a baby. As a toddler, Alex would sometimes hug her a little too enthusiastically, but Dee Dee never nipped at her. It was as though Dee Dee knew that Alex was young and she had to be patient with her. When her patience ran thin, she simply walked away. Nothing was more heartwarming than the nights when Alex would go to bed, and we would later find Dee Dee lying outside her bedroom door, as if she was protecting her. 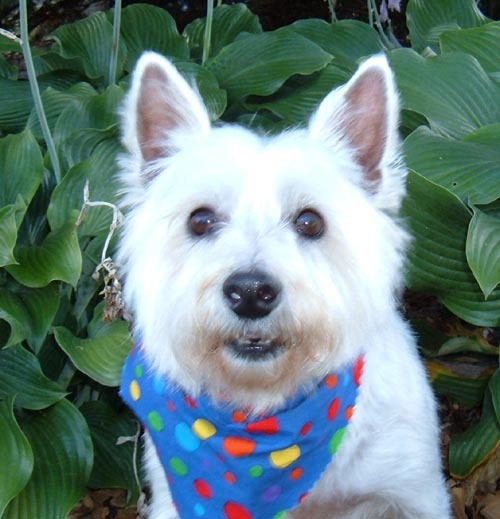 When she was 11, Dee Dee became a Therapy Dog at a local Assisted Living Home. She did this for 5 years, retiring just before her 17th birthday. We never grew tired of having the residents try to guess how old she was. None of them ever guessed her age correctly, as she still looked so young and got around so well. She was a kisser, and undoubtedly brought untold joy to those dog-loving residents she bestowed with her kisses throughout the years. As she got older, she developed a particular fondness for napping. In fact, some of our sweetest times with Dee Dee were the weekend afternoons we’d spend curled up together on the couch, napping. We didn’t have children or any other pets, so she was our baby, and (admittedly) pretty spoiled. She didn’t start off sleeping in our bed at night, but somehow through the years, it became a regular thing. We were always amazed at how such a small dog could take up so much space. Many a morning we’d wake up practically hanging off the bed, while Dee Dee was laying sideways, taking up more room than the two of us combined. Dee Dee was a special dog, and we feel very fortunate that she was such an integral part of our lives. When we adopted her as a 9-year-old, we never imagined that we’d be lucky enough to spend 8 years with her. Saying goodbye to her was one of the hardest things we’ve ever had to do. We will miss her terribly, but we have wonderful memories of our time with her, and we look forward to the day when we will see her again at the Rainbow Bridge. Darla and her brother, Spanky, were foster dogs in 2005. They were adopted together and lived long, happy lives in their forever home. While we are sad to see our foster dogs pass, we love knowing that they were loved and cared for. Fred came to us as a baby…..when he arrived in our life he came out of a crate twisting and dancing and peeing he was so excited. As were we and it was instant Love….Fred loved everyone …. 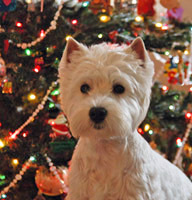 He actually went on to become the Leader of a pack of 5 sometimes 6 and occasionally 7 Westies and of course his favorite Scotty sister Jazzy. He kept everything running smoothly…..He also knew he was his Daddy’s favorite no matter how many or who was here…He also was able to go to the nursing home at Christmas dressed in his Elf outfit and delighted so many there….not sure who enjoyed it more the residents or Fred….Always the ham always ready for belly rubs… Always ready to go somewhere anywhere ….as long as he could ride….He will be so missed by his family …..We know he will be waiting for us at the bridge….. When a dog like Tinkerbell comes into your life, she brings her boundless love, the gift of her companionship, and the curative powers of her kisses. She was a proven and patient listener except when a lovely red ripe tomato or cucumber or pepper from the garden was present. When we rescued her we received such a wonderful gift. The price we paid for this gift was that when she left us she took a piece of our hearts. Thank you Tinker we love you and we will miss you. You were our special girl. 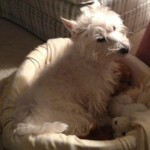 Tinkerbell came in to foster care because her owner could not afford her medical care. She was fostered for quite some time and earned the reputation of being a “very sweet little girl”. She was adopted by one of her foster homes and very quickly became their “sweetheart”. Tinker will be remembered by all of us who knew her well. 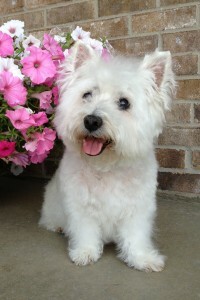 Miss Molly Marie, age 15 3/4 yrs, has joined Glennie, somewhere over the rainbow. I can only imagine their joy at being reunited. I didn’t understand at the time, why God took Glennie first. But now I know that it was because Glennie could not have handled these 2 years alone without his sister. 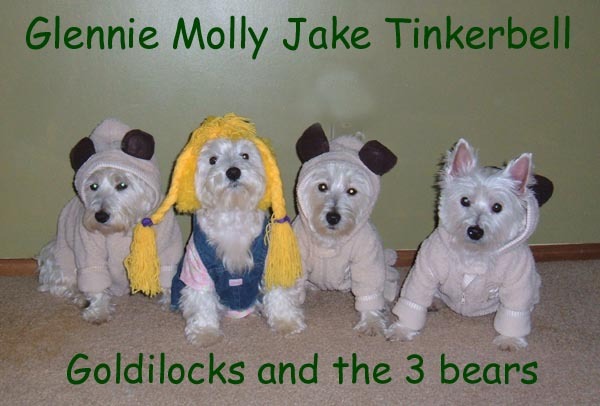 Molly was much better suited to being the one left behind. But now they are together again and I know they are both happy and well. How do I tell you about Molly? She was an exceptional little girl. She was so full of confidence from day one. She so thoroughly believed in herself that I’m sure she imagined she was the best in the world at even the things she didn’t do all that well! What would it be like to be so sure! “No small amount of self-esteem” surely did describe her well. Molly was the best sister in the world. She adopted Glennie when he came in as a foster and she showed him how to be brave. She loved that little boy and must have missed him horribly. And of course, she was good to Jake too although it wasn’t until after Glennie left that they became close. Molly was a great foster sister to all of the dogs who came here. She did so much of the training for me. When a dog would come into foster care, I’d take them out to pee. I’d say, “Go pee” and they would look at me. After a couple of tries, Molly would walk over and pee in front of them. They would then, of course, pee on top of her pee and I could praise them. Housebreaking made easy! Molly tried nose work but we didn’t have time to really get into it. But she loved the introduction and would have loved the game. Barnhunt didn’t come soon enough for her but I’m sure she would have loved that too. The highlight of their lives came near the end when they both played Toto in the Athens High School play. This wasn’t a rinky-dink production. It was unlike anything I’ve ever imagined to see in a high school. For eight productions, Glennie played one scene but Molly did the majority of the play. She was 13 years old and on stage almost the entire time, off leash, and did an amazing job. I will always believe she was the star of the show! She later attended “Dorothy’s” graduation party as a surprise guest. I have several videos out there on You Tube from the show. I think my favorite is the one where Dorothy was singing “over the rainbow”. Molly lay down in front of Dorothy and gave her the most adoring look. But if you look http://www.youtube.com/watch?v=YWxlJhbSNU0&feature=channel&list=UL at this one, you can find others. Watching her follow the yellow brick road still takes my breath away. And I held my breath during the poppy field scene where she had to pretend to be asleep while the Tin Man and Scarecrow danced around her. She managed to do it every single time! I am ever thankful that we had the opportunity to be a part of this show. But most of all, Molly was my best friend. She and Glennie were with me for so long that it felt like we were “one person”. I only spent 3 nights apart from her once when she was very young. I missed her so much I never left her again. Even knowing that we will most likely outlive our pets doesn’t make this one iota easier. I am thankful, though, that we had a reprieve after the initial diagnosis so that we could have a long “goodbye”. Heaven is our best dreams come true. All the things we normally think of for our best friends. To chase and hunt to your heart’s content. Your hair will not grow and you will not get dirty. or expect you to take a bath! That is what heaven will be for you! When she got sick, I told her to go with Glennie when she saw him. Today she did. 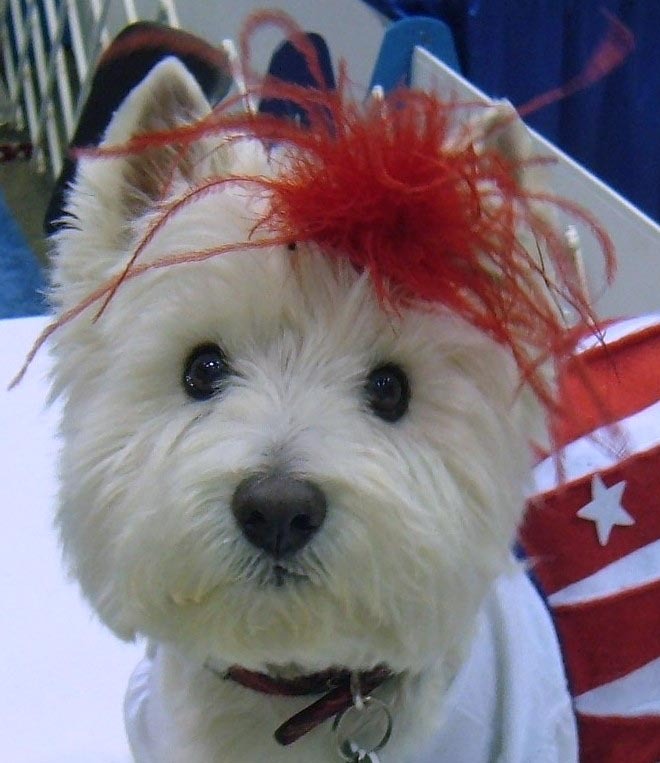 Bon Voyage Molly….have fun and don’t fret….we will one day all be together again. Spanky…The sweetest boy on the face of the earth. 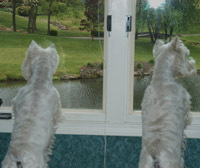 We were blessed with Spanky and Darla when they were 8 years old in 2005 from the Michigan Westie Rescue. They were surrendered together so they stayed together. They immediately became our “fur babies” since we did not have children. Spanky loved everyone and people that didn’t fancy fur babies would meet him and fall in love too. It helped that he had the cutest face and personality that you could not help but love. He loved to talk and could even say “mumma”. 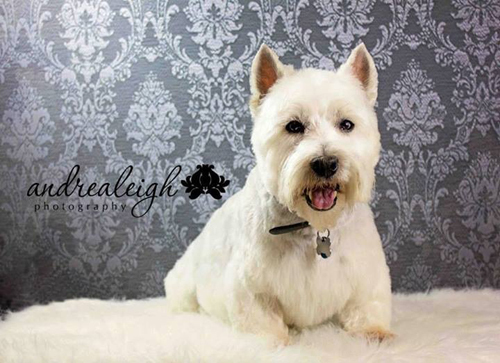 He was a Westie through and through and could wiggle out of a belly band quicker than David Copperfield could do a trick. Spanky LOVED to travel. Luc traveled for work so we would pack Spanky & Darla in the car and off we went. 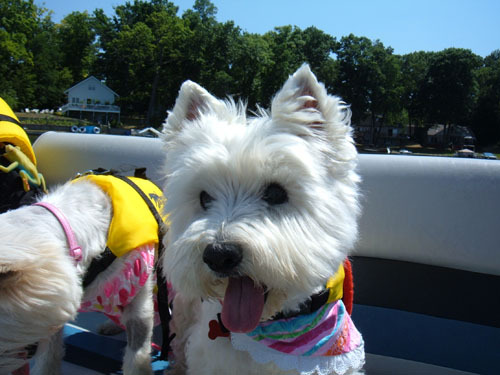 They have stayed at many pet friendly hotels in from Toronto to Florida and everywhere in-between. 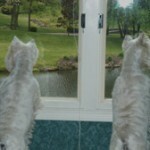 He and Darla became the “resident Westies” at the Westin in Atlanta when we stayed for a month prior to moving there. He loved to ride on the bell cart and the treat he got when he would pass the desk! A Cinderella rescue story for sure! Spanky had a huge appetite and knew when it was time for breakfast and dinner and would start talking to us about an hour before each meal. Yes, that included talking at 5am! That was OK because he and I would get up at 5am and that was “our” time, coffee for me, raw patty for him. He loved to cuddle but loved his space too on his pillow that he slept on above my head. 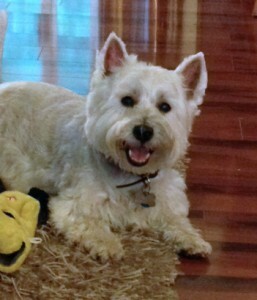 We moved back to Michigan from Toronto in January, 2013 and about a week later found out that our sweet boy had Westie Lung Disease. I don’t think I have tried so hard at anything in my life but to try and save his life. Mumma is good but that one I just couldn’t do. 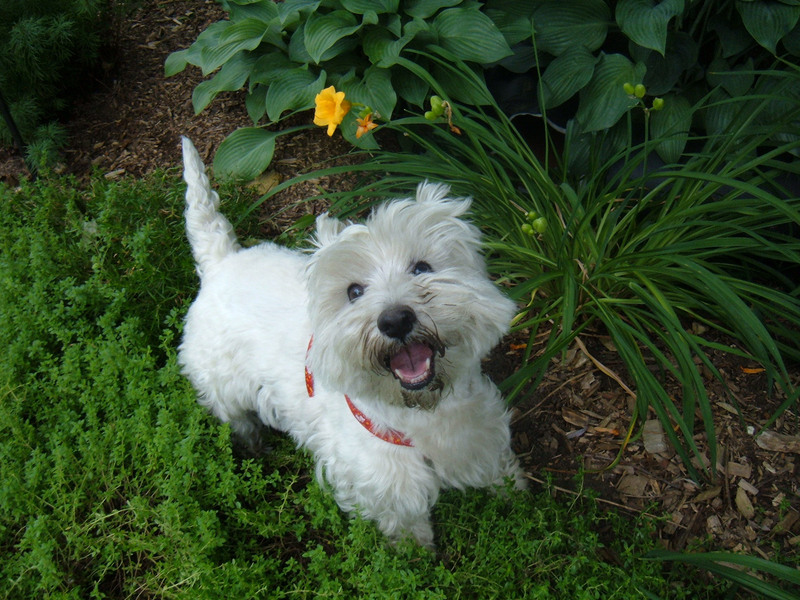 Our sweet Spanky passed away on May 10, 2013 in his mumma’s arms. I will forever feel like a piece of me went that night too and miss him so very much it hurts. I don’t think I could have loved my own child any more than I loved that little man. and health issues, he became a permanent foster dog. This tribute was written by his foster mom. 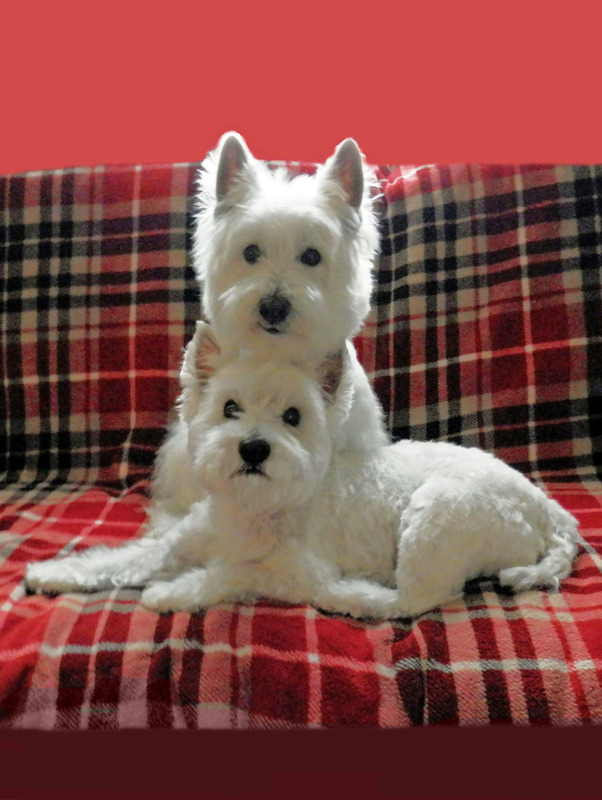 It has always been said that when it comes to Westies, the boys are the lovers. We sure found this to be true of our Duffy. 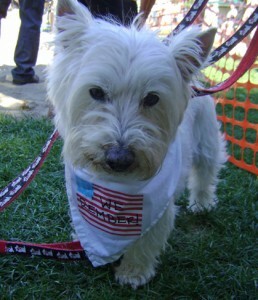 He came to us in October of 2011 through Westie Rescue. He was extremely matted and had such badly infected ears that they were swollen shut. We would later determine that he lost his hearing. He never expected much. He was happy to discover a bed that our Jack Russell used to sleep in, which by the way was much too small for him, and was just content most days to be left alone. We bought him a bed much more suitable to his size and that was just fine with him too as long as you kept it in the exact same spot all the time. If we happened to move it, we would still find him lying right where the bed should have been as if to make a point. 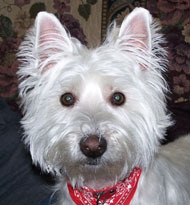 He never attempted to play with my other 2 Westies, Tinker and Piper and they just seemed to respect that he was old and wanted to be left alone. He never wanted to run and play with toys but in the last few months began bringing them to his little bed where he would kind of snuggle with them. He didn’t particularly like to be petted anywhere but on his head….he loved his ears rubbed, but definitely didn’t want you to rub his belly or anywhere else for that matter, but sure was happy to snuggle up on your lap as often as possible. It always made us kind of sad to think about what his life was before we found him. How could anyone let such a lovable little guy become so worn down. We learned to just do what we know he loved hoping with our hearts that it was enough and somehow we just knew that he appreciated being well loved and taken care of. Duffy was special to us and we hope the year and a half that he had with us made up for whatever hell he had to endure for most of his life. He took a piece of my heart in a way that none of my other kids did and not because I loved any of them less or more, but just because I think his world wasn’t so great before he found us. Rest in peace my little friend…..see you on the other side. We remember Daisy Mae with sadness. Life was more than she could handle. We hope that her life at the Rainbow Bridge is happy and carefree, and all she should have had here on earth. 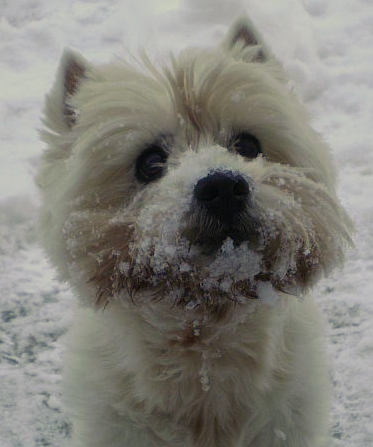 Of the four Westies we have had over these many years, Laila was the sweetest, most loving and playful of them all. She was born May 25, 2009 and came to us later that year. We only had her 3 short years but the joy she brought to our family and the friendship she provided to our older gal Gracie was unmatched. We still hear her playful yips and see her streaking across the backyard after the ever elusive squirrels and chipmunks. She was an eager traveler and loved going to Grandma’s where she would look out the window at geese and ducks in the pond behind her house. If we ever needed a companion for a short jaunt to the store, she was ready to go. 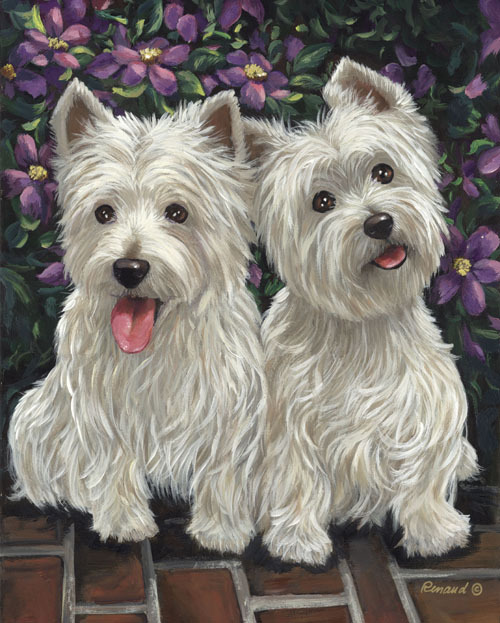 With our children grown and married she and Gracie were our constant companions. We held her paw for a short time but will hold her in our hearts forever. Sasha, being a former racing greyhound and having left the race track where there were lots of dogs who mingled several times a day to living her comfortable life with her pack of 4 Greyhound former racers and our Great Pyrenees, completed her dream life. She did adjust ok with the loss of each of our large graceful dogs until our second last, good old Trudeau. Then she seemed at a loss to move on with her own life. 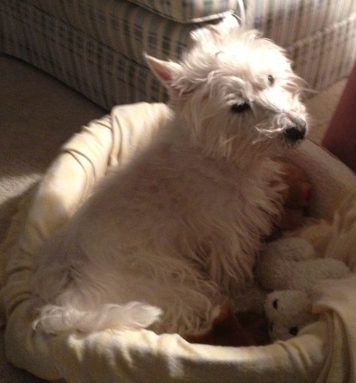 Welcome Timmy, our sweet rescued life-saving Westie from SE Michigan. 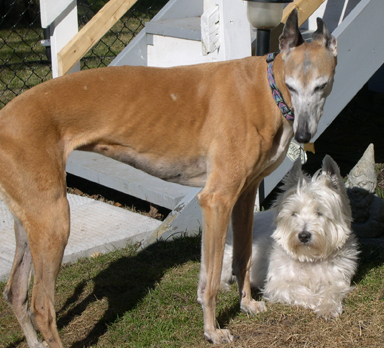 Living life with our little Greyhound and smaller Westie was complete for us. Those two were closer as pals than we imagined, judging from the long grieving that wee Tim has experienced. Both Sasha and Timmy loved their daily walks. 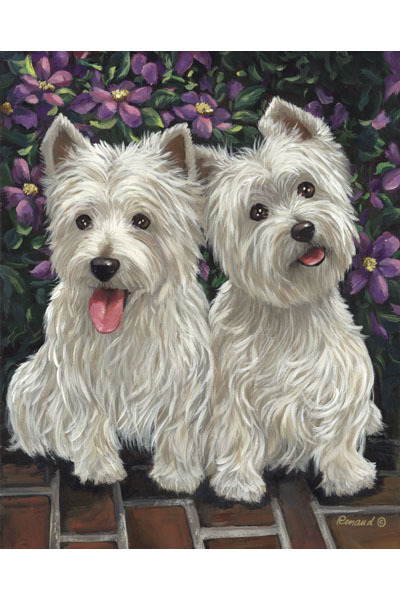 They also loved to see who could beat whom in a race to bark at anything or anyone deemed bark worthy. Sasha graced her outdoor walks as a performing ballerina or a prancing model crossing one foot in front of the other, head held high while Timmy pressed on, trot trotting, forever on squirrel alert . People would stop in cars, summer and winter saying “What a beautiful dog, she looks like a deer.” Even though she was a very small Greyhound, she made it up in smarts. Greyhounds love to run, it’s excitement, ingrained in the breed. Always the “little one” but cunning and competitive when it came to racing against her Greyhound family, circling the abundant fenced back yard in our former home, she would streak with jet speed but shorter strides across the imaginary circle landing herself in front of the pack, and then natter at the other three to stop them. She aged quickly in her last 6 months, daily walks were perhaps twice a week. Now very reluctant to leave her Dad for even a second, she followed him everywhere or cried when she couldn’t. Not having Sasha around has become a very quiet house. Her loud screams of delight greeted us if we left for only 15 minutes and we had accustomed ourselves to her foot stomping dance upon our tender feet. Timmy knew to greet us from a chair so as not to get hit with the tail. We three remember our dear girl and we still get our greets from the chair with tender little Westie kisses. Sasha is most likely still racing with her sisters & brother, unencumbered.